Sushmita Dev said the BJP has pitted Muslim women against Muslim men through the triple talaq law. New Delhi: The Congress will scrap the triple talaq law if it forms the government in 2019, the party’s women wing chief Sushmita Dev said on Thursday. However, Congress’s chief spokesperson Randeep Singh Surjewala said the party had made its stand clear even before the decision was made in the Supreme Court, that it is opposed to the practice. “Triple talaq does not have a place in this modern society. We have said that when you send the husband to jail, who will pay for the maintenance of the family. The society and the parliament has to decide that. We want an amendment to include maintenance for the family,” he said. But Dev, addressing the Congress’s minority department convention here, alleged that Prime Minister Narendra Modi has pitted Muslim women against Muslim men through the triple talaq law and that her party will “scrap this law” if voted to power. “A lot of people told us that women will be empowered if the triple talaq Bill is passed. But we opposed the law because it is a weapon that Narendra Modi has prepared to put Muslim men in jail and make them stand in police stations,” the All India Mahila Congress chief said. The BJP strongly reacted to Dev’s remarks, saying Muslim women and the people of India will not forgive the Congress for its “perverted mentality”. It accused the Congress of following the policy of appeasement. “Look at the audacity of Rahul Gandhi? His party…to appease says that if we come to power, we will not care about the Supreme Court (and) we will ban the ordinance, the law and the Bill that the prime minister is trying to bring in consonance to what the Supreme Court has said,” Patra said. 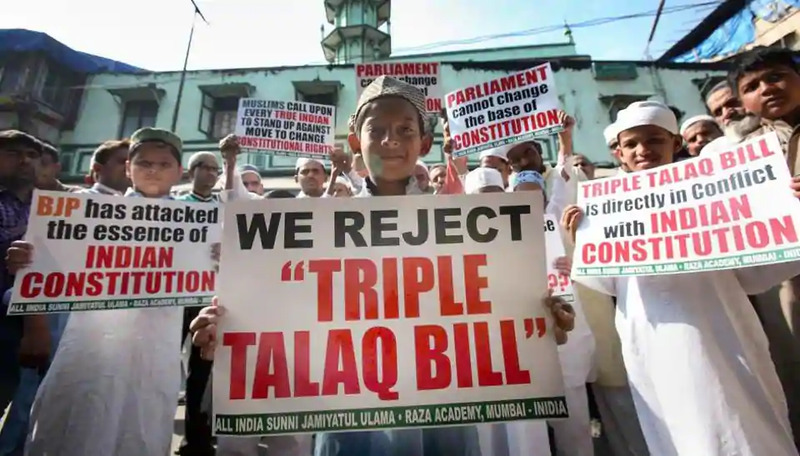 With the triple talaq Bill continuing to face resistance in Rajya Sabha, the Centre issued an ordinance in September last year, incorporating certain amendments. The Centre maintains that despite the Supreme Court striking down the practice of talaq-e-biddat (instant triple talaq) as unconstitutional, men were divorcing their wives on flimsy grounds and even via WhatsApp. CPI(M) senior leader Brinda Karat said the Congress is “confused” if it wants to amend or scrap the law. She said while the women’s wing chief said the party will scrap the law, the chief spokesperson said the party only wants to amend it. Karat said the Congress should first come to a consensus on what decision it wants to take. “The law is discriminatory against Muslim men. There are laws to deal with desertion of wives. Those laws will suffice, there is no need to bring in another one,” she said. She instead suggested that people should be made aware of the existing laws. Karat also said that the CPI(M) is opposed to the practice of triple talaq, but did not support the legislation put forth by the BJP-led NDA.